A while ago when Barnes & Noble put the Nook Simple Touch on sale I got one – thinking that for £30 then at the very least I’d rip it open and use the eInk screen for something geeky. I ended up liking it and actually using it for reading books. I liked it even more when I found it was possible to add wireless charging. I was very impressed with Tom’s original work. 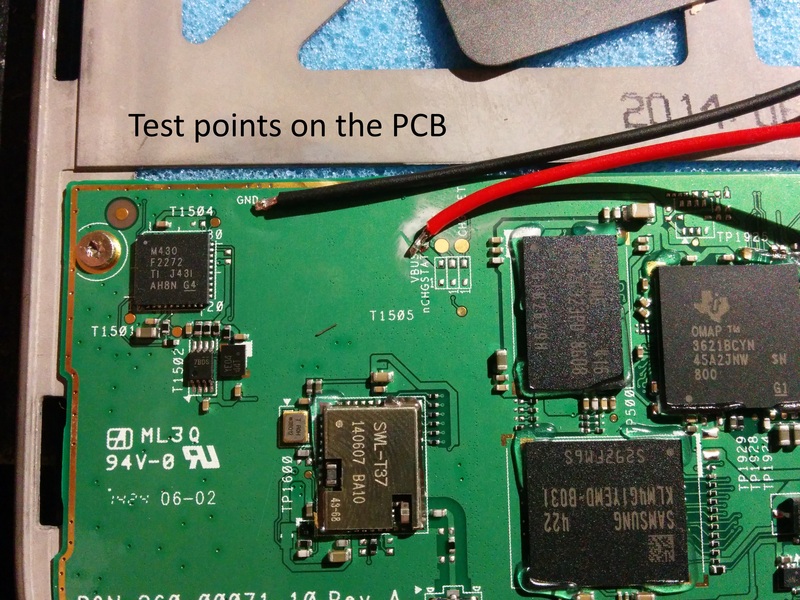 I did manage to make a slight improvement by finding some easier points on the PCB to connect to – a couple of test points marked T292 and T334 on the more accessible side. You can see these connections on the photo. When the new Nook Glowlight came out I thought it was time for an upgrade, but I’d really miss that wireless charging. Well I’ve got some good news for you. It’s possible! Not only that, but I’d say it’s probably easier to do. We still use the same Galaxy S3 wireless charging pad. Mine was £3 shipped from China by and I had no problems. I bought from befdi but there are many other sellers that I’m sure are fine too. Ease open the case. No screws, just clips. Open up that case. There’s no SD card to remove or screws holding it together. Just take the rubber trim off and you’ll see some small white tabs holding the back on. I found that flipping it over and applying some gentle pressure for a small screwdriver or even a butter knife made it easy to take off. There are 2 top and bottom and three on each side. As you can see them from the front they’re easy to pop open without breaking or marking your new Nook. Then open it up like a book. 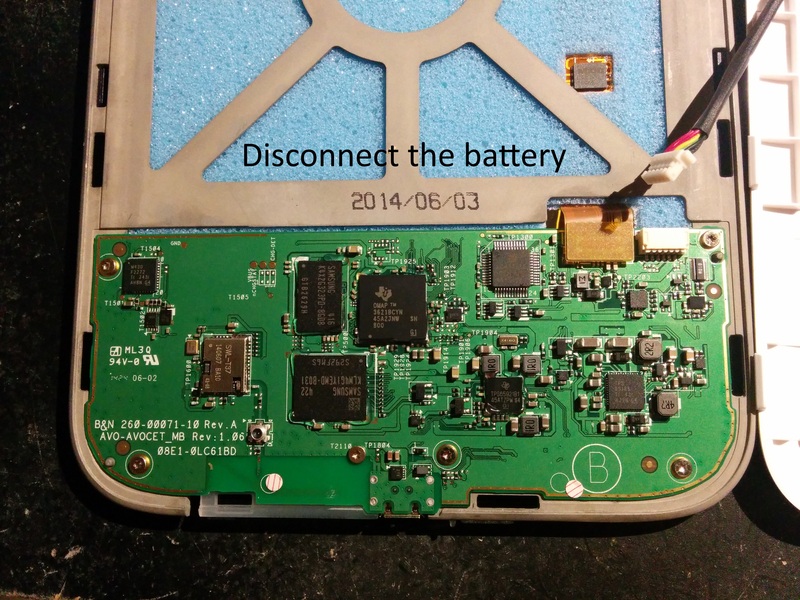 You’ll probably want to disconnect the battery as a precaution, but that’s all the disassembly you’ll need to do. Whilst working out what to do, I disconnected the display (just pop the connector up off the PCB), unscrewed it (6 x T6 screws) removed the PCB and disconnected the ribbon cable for the IR touchscreen, All of these turned out to be completely unnecessary but I liked to have a good look around anyway. No warranty-voiding stickers need be removed. 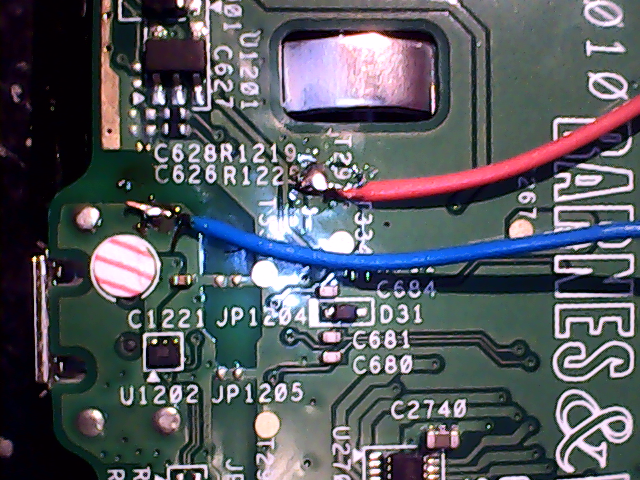 Whilst the PCB on the Glowlight is far more densely packed than the Simple Touch, and some of the test points are absolutely tiny, this modification turned out not to be as difficult as expected. The only points you need to access are reasonably large and marked GND and V-BUS. They’re on the more accessible side of the PCB even though the USB connector is on the other. Dab a little solder on to tin these test points, tin your wires and solder them together. Pre-tinning both means you transfer less heat to the board. Now it’s time to connect to the charging pad. Note the polarity of the connection from the photo. Maybe measure yours with a multimeter just to be sure. I found when soldering that the two gold pads to connect to the phone completely came off. It’s easier with these out of the way so don’t worry. Be careful with the heat though. The pad seemed like it would melt fairly easily. Unfortunately my first attempt at locating the Qi charging pad didn’t work. 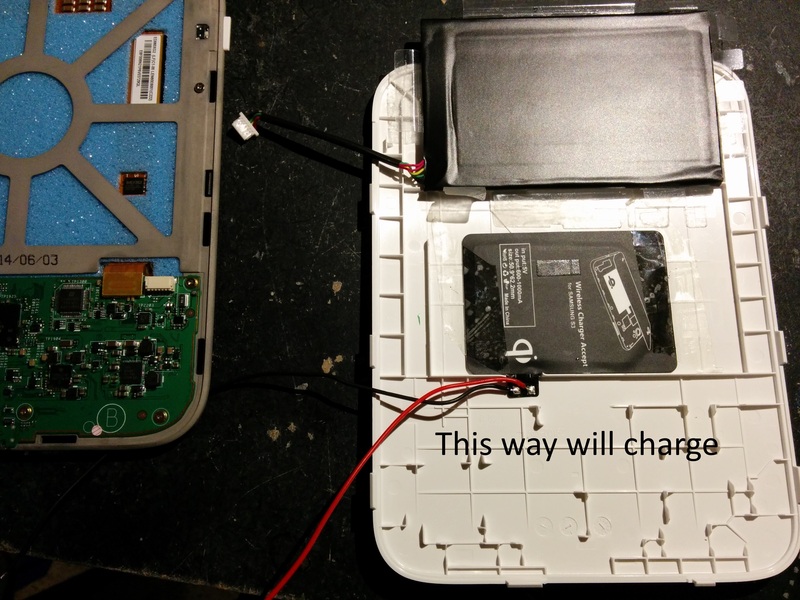 I positioned the pad as shown with the connectors facing away from the Nook and towards the charger. I figured there would be less chance of a short. Placing it on my Nokia charging pad did nothing. 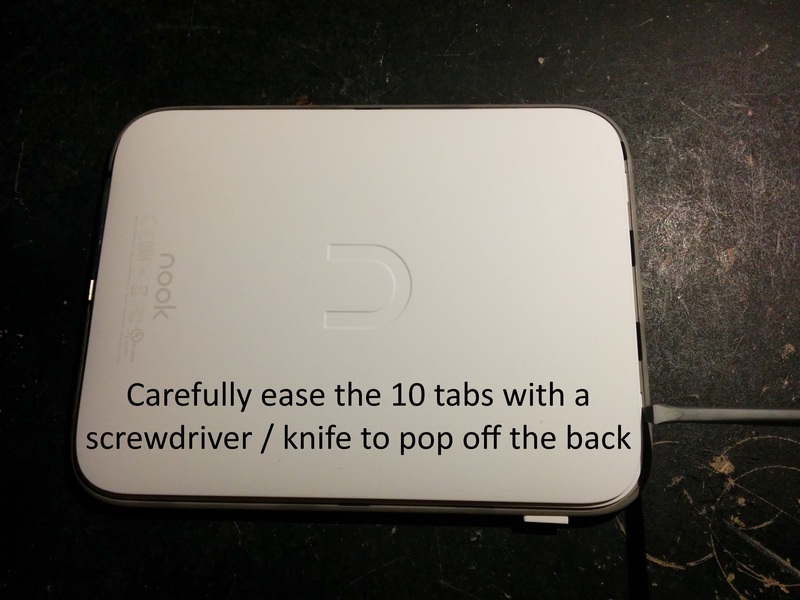 I was relieved that the Nook and USB charging was unaffected. 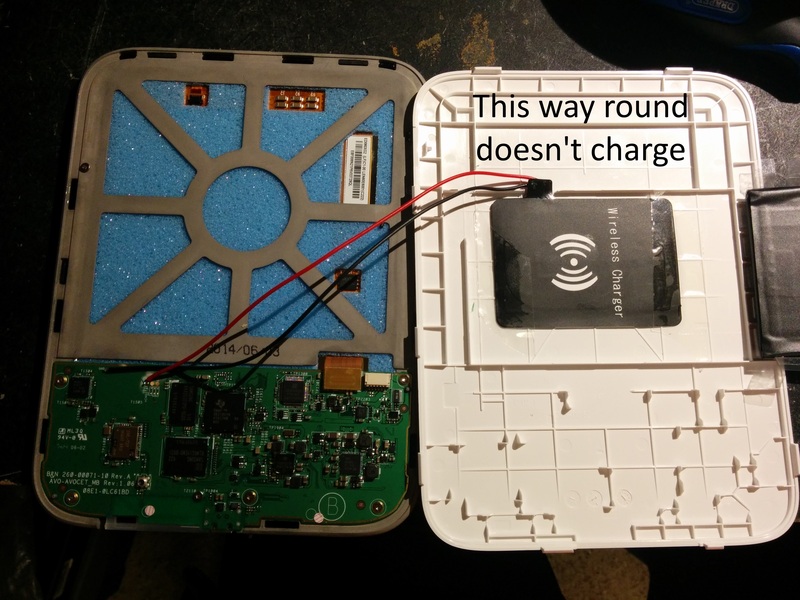 It turns out that it won’t charge unless the “Wireless Charger” logo faces the Qi charger. 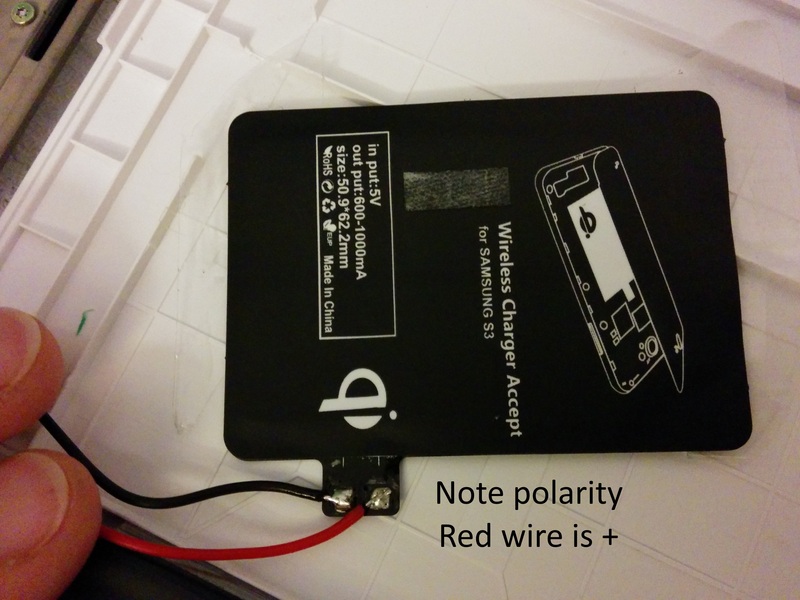 I measured the output voltage both ways up and if it’s the wrong way you get nothing at all. I was surprised but that’s how it was. To be honest I hadn’t thought of this when I modified the Simple Touch. Just luck that it was the right way round I suppose. My second attempt flips the pad around and so has the connectors nearer the PCB. Whilst these shouldn’t actually short anything because they’re a little about the PCB, cover them with a bit of tape anyway,. Well – that’s it! Pop the case back on and you’re done. £3 for the receiver and maybe 15 minutes work and you now have a wireless charging Nook Glowlight. Apart from a couple of tiny blobs of solder on the PCB and a small cutout from the webbing on the back case your device is unmarked. You’d never know from the outside and could probably remove it if you ever needed to return it under warranty and nobody would notice. Your warranty is void though. You know that, right?